Gift Rap is an online video slot with a Christmas and music theme with related graphics and symbols. The game is a 5-reels slot with 25 paylines that was created by Microgaming software platform. 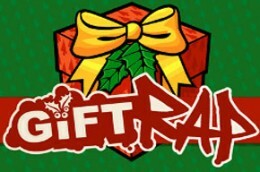 Gift Rap offers to its players wilds, scatter symbols, free spins, and a “Gift Grab” bonus game. All symbols are theme-related and they include a teddy bear, a monkey, a squeaky hammer toy, a spinning top, a child’s microphone and speaker. The higher value symbols are represented by female rappers and two elves. The wild symbol is a Gift Rap bauble and the scatter symbols are a snow spray can and a Jack In The Box.